The Right Side Guide - The Jon Knowles Quick Draw System Series 1: Draw Faces Now! Art Instruction Kit! 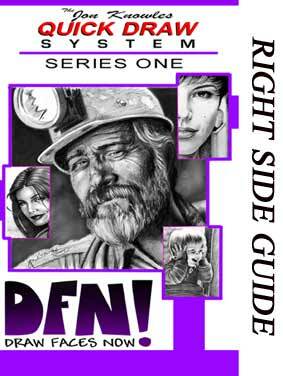 From viewing tips to the Quick Start Art Chart to the Boot Camp work sheets, the Right Side Guide has you covered. It is a 32 page, step-by-step instructional manual to help guide you through the Draw Faces Now! program. 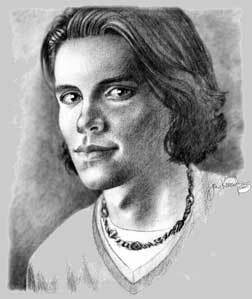 It contains everything that you will need to learn the proper techniques to quickly improve your drawing skills. 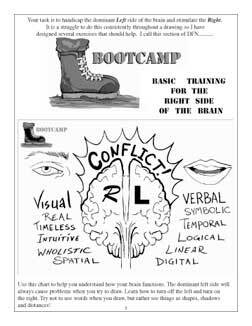 As you go through "Boot Camp," you will understand the conflict between the creative right side of the brain and the logical left side of the brain. Once you allow the right side of the brain to take over, you can "see" like an artist. 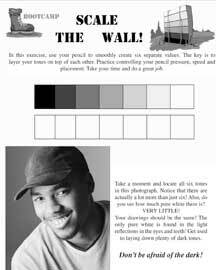 This is an example of a "Boot Camp" exercise in which the viewer is taught to "Scale the Wall!" In this exercise, you will use your pencil to smoothly create six separate values. Identify the light direction and look for shadows. Lightly draw the shadows as shapes. Don't tone them in yet. Smooth Moves are Jon's extra tips and techniques to DFN! "Use a paper stump to BLUR the tones. Leave the subject untouched and it will look more like a photograph because of the tight focus fore ground."